I hope you enjoyed our big birthday bash at AAA Cards. It was a whole lot of fun. The party's over, but we're still, and always, having fun! It's time for a new challenge at AAA. Game #66 is up, and the theme is Watercolor. Our generous sponsor this week is Happy Little Stampers. The first place winner will receive a $20.00 Gift Certificate for the HLS Store! We also have the lovely and talented Tracey McNeely joining us as Guest Designer for this challenge. I used my Brushos for my watercolor project below. This is a mono print using the gorgeous Hibiscus Stencil from Design By Ryn. I LOVE it. The sentiment is from MFT's "Because" stamp set and die. Please head on over the the AAA Cards Challenge Blog, check out the gorgeous watercolor creations by the Design Team, and then create a watercolor beauty of your own. Don't forget to make it CAS!!! PS, don't forget to check the AAA Cards Challenge Blog next Sunday, June 12th to see if you are one of the lucky winners of the many prizes that were offered for participation in our Birthday Celebration!! 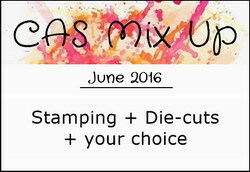 CAS Mix Up - My sentiment combines stamping and die cutting and the third element is water color monoprint. 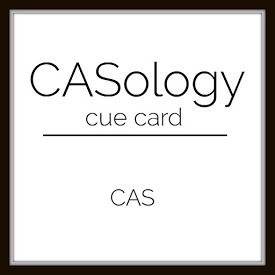 CASology is celebrating their 200th Challenge! Absolutely gorgeous, Stephanie. So artsy and wild. Thanks so much for playing along with our 200th challenge at CASology. Your stencil monoprint is AMAZING Stephanie! Love how it turned out. Beautiful design with the die-cut and stamped sentiment. Thanks so much for sharing with us at CAS Mix Up! A fun and striking design and beautiful colour combo stephanie. Super classy and clever. What a beautiful stencil, Stephanie! I love the Brusho colors and the dramatic die cut! Wonderful sentiment! Thanks so much for sharing this with us at CAS Mix Up! This is beautiful, Stephanie!!! Love the look of the watercolors and that bold die cut sentiment! Amazing card! I love the explosion of colour the brushos give, they are my favourite paints to play with! I have to try the stencil monoprint technique again. Thanks for sharing. I have pinned your card btw for future inspiration! The stencil makes a fabulous effect. I was keen to know how you'd done it. It looks like a beautiful one.